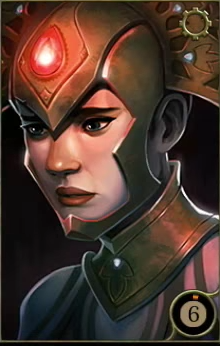 Sirin is a Companion in Tyranny. This page will be updated when more is known. In Combat Sirin is designed to control and manipulate battles by afflicting her foes with sicknesses of the mind and body. As an Archon she can influence others through her songs. She will passively sing, causing various debuffs on Enemies and buffs on Companions. As she sings, she builds up something called Breath that she later uses to unleash an Aria. Arias are powerful magical effects from Sirin’s voice on targets which can be very deadly or beneficial depending on if the target is friend or foe. Sword of Strength, Sword of Justice: A song of valor and defiance. Adopted by the Vendrien Guard to boost morale in their rebellion. Raises the Might, Wits, and Vitality of nearby allies with the sound of Sirin’s voice. Bringer of Death: A song ominously describing the power of Kyros’ will as it washes over life and land, reaping those that stand against it. Lowers the Resolve, Parry, and Dodge of nearby enemies, as well applying the Weakened affliction to them. Blood Brings the Dawn: A powerful battle chant Sirin was forced to sings for the Scarlet Chorus to inspire their victory. Raises ally movement speed and causes enemies to take Fire damage and Bleed effects. Aria of Respite: Sirin’s notes seep into the minds of her allies and draw them to lucidity. Removes a hostile effect from each ally affected. Aria of Confusion: Sirin bombards her enemies with a cacophony of tormenting sounds. Those that fail to resist her power are Confused. Sustained Breath: At the end of combat, Sirin can retain Breath for several minutes. Rapid Tempo: Sirin accelerates her vocal progressions, increasing the speed of her songs and causing her to move through each stanza more quickly, but shortening the duration of their effects. Guise of Innocence: While not wearing Heavy Armor, Siring becomes immune to engagement. Aria of Nightmares: Sirin recalls a nightmare and begins to sing. The power in her voice creates an physical embodiment of her memory that will terrify and torment her foes. Can&apos;t find much how to rise her loyalty. Seem to me the best buffs are in Conquest. Well, got 0 boost from them in my run. She has loyalty slightly over 1 and 1/2 after some conversations. People point out you can rise her loyalty in burning library which I don&apos;t have acces to yet. Then some say save beast child which I can&apos;t find anything about. Then she can sing for Kill-In-Shadow and I have no idea how to start that conversation. Sirin is best girl. The only cute character in the game. I didn&apos;t note specific instances, but Sirin generally gains fear when you perform actions helpful to the Voices of Nerat or behave in a subservient manner around him. Being snarky to him and speaking negatively about him to others will often grant favor. Favor is also generally earned when putting trust in Sirin&apos;s opinion and actions and supporting her independence. I had trouble gaining Favor from Sirin, she comments a lot but these don&apos;t give fear or favor. So I would like to start a list of opportunities. 1. When confronting the Censor at the Silent Library, the &apos;When you ran crying&apos; line gains Favor.